This stage has breakaway written all over it. It’s the longest stage of the Vuelta and it’s too hard for the sprinters to bear any hopes of fighting for glory at the end. In the road book, the total elevation gain is set to be 2010 meters. However, in reality, there is much more climbing to be done. From the start in Mombuey, the first 30 km are predominantly flat. Afterwards, it’s either up or down for the remaining 177 km of the stage. Most likely, the break will get away on the category 3 climb Puerto del Padornelo. 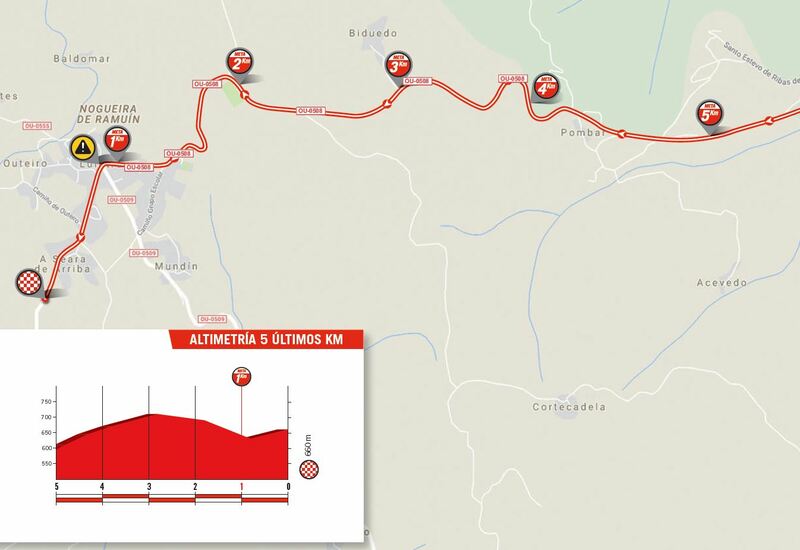 The 5.7 km towards the top have an average gradient of 5.3 % and will ensure that only those riders who are can climb well will make it into the front group. A long stretch of leg-breaking terrain awaits the riders as they make their way towards the intermediate sprint in Castro Caldelas and later the last categorized climb of the day, Alto del Mirador de Cabezoas. This ascent is 8 km long and has a steady average gradient of just over 4 %. From the top, there are just 17.8 km left to go. The following descent is fast but also very twisty on a small road. A skilled descender could easily open up a gap before taking on the final climb, which begins with 5.5 km to go. Alto de Pombal isn’t categorized but that doesn’t mean it isn’t hard. It comes after over 200 km on the bike it kicks up with an average gradient of 8 % for about two kilometers. This is where Simon Yates attacked in 2016 and soloed to victory. After the climb, a short section of false flat follows before a descent leads the riders onto the final kilometer. Here, the road starts to rise once again as the final 600 meters are uphill with 4 %. The last 35 km of today’s stage are the exact same ones as the riders did back in 2016 when Yates took the win. Given that this stage most likely will be a matter for a breakaway, it’s hard to mention any real favorites. The early climb will dictate which kind of riders can make the break but the list is still long. In order to win you need to be able to cope with the climbs, be good downhill and have a solid kick in an uphill sprint. From a breakaway, riders like Dani Moreno, Gorka Izagirre, Dylan Teuns, Jesus Herrada, Omar Fraile, Fabio Felline and Jay McCarthy look like good picks. Due to their fast finish, Eduard Prades, Bjorg Lambrecht and Ivan Cortina also stand a good chance if they make the break. Lluis Mas, Alex Aranburu and Jonathan Lastra of Caja Rural will fancy this type of stage as well. If the GC riders end up fighting for the stage win after all, the number one favorite has to be Alejandro Valverde. Having won two stages already, this is another perfect finish for the Spanish veteran. A stage win and bonus seconds today will also put Valverde in the red leader’s jersey. In fact, this may happen anyway if he manages to take back just one second on Simon Yates who may not be so interested in keeping the jersey and wasting his team in the coming days. Looking at the rest of the riders high up in the general classification, Tony Gallopin and Michal Kwiatkowski should also be able to perform very well on this finish.